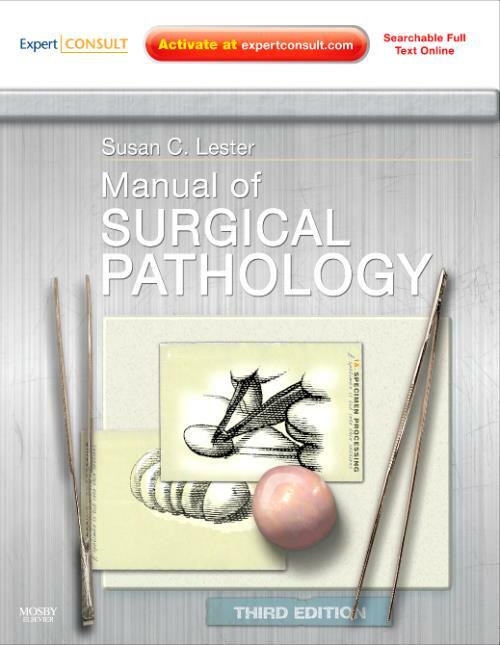 Dr. Lester's Manual of Surgical Pathology, 3rd Edition offers complete, practical guidance on the evaluation of the surgical pathology specimen, from its arrival in the department to preparation of the final report. Inside, you'll find step-by-step instructions on specimen processing, tissue handling, gross dissection technique, histological examination, application of special stains, development of a differential diagnosis, and more. This thoroughly revised New Edition integrates cutting-edge procedures well as the latest staging and classification information. Coverage of the latest standards and procedures for the laboratory and handling of surgical pathology specimens are valuable assets to pathologists, pathology assistants, and anyone working in a pathology laboratory. Plus, with Expert Consult functionality, you'll have easy access to the full text online as well as all of the book's illustrations and links to Medline. Lester, Susan C. Chief, Breast Pathology Services, Brigham and Women's Hospital; Assistant Professor, Harvard Medical School, Boston, Massachusetts, USA.